Elf Shelf® Holiday Shop promotions are available to all schools with at least 200 students who reserve their shop by October 1. Additional steps required for Rewards Program. Kid Bucks – Kid Bucks come in $.50 denominations and schools are not charged for gifts purchased using the Kid Bucks. Kid Bucks may be distributed however you like. Some schools hold a raffle to award them while others simply place a stack with the cashier. Use your imagination to get the Kid Bucks to the students who need them most. Rewards Program -Reserve your Elf Shelf Holiday shop by May 1 to receive 5 points per dollar remitted in payment for your sale. Reserve May 2 – October 1 and receive 3 points per dollar remitted. 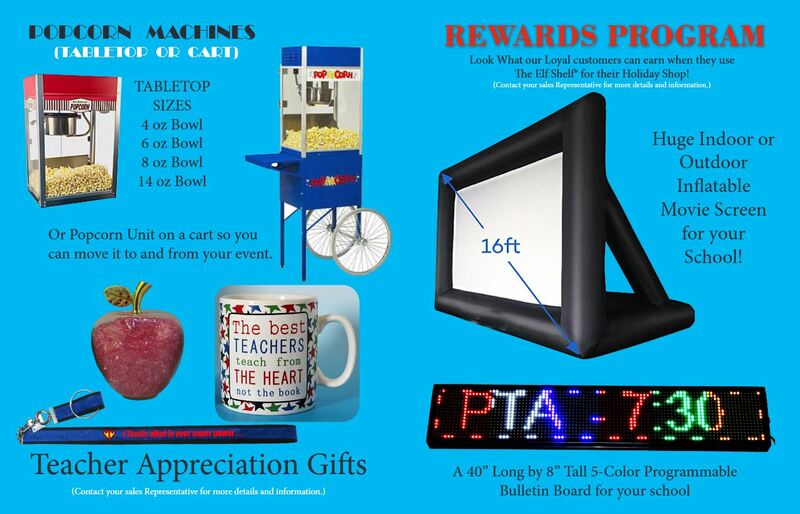 Redeem points to receive teacher gifts, $300 Carnival Prize/Student Store Package, Electronic Sign, Popcorn Machine, or even a giant inflatable Movie Screen!